David Yoo (Operating Partner at NewViewCapital) gave us a really interesting talk on the Jobs to Be Done framework. You can find his main points in my sketchnotes. It focuses on the “why”, then “what”, then “how”. It holds the product management accountable for their decisions — Why are you build this? Are you truly going to solve important problems for customers? What the brand is what your customers says about you. It encourages the product team to get close to its customers, learning in depth about their day-to-day activities. Those who solve the problems better thrive. It emphasizes both “jobs” and “experiences” and acknowledges the fact that people are not satisfied with “getting the job done” any more. 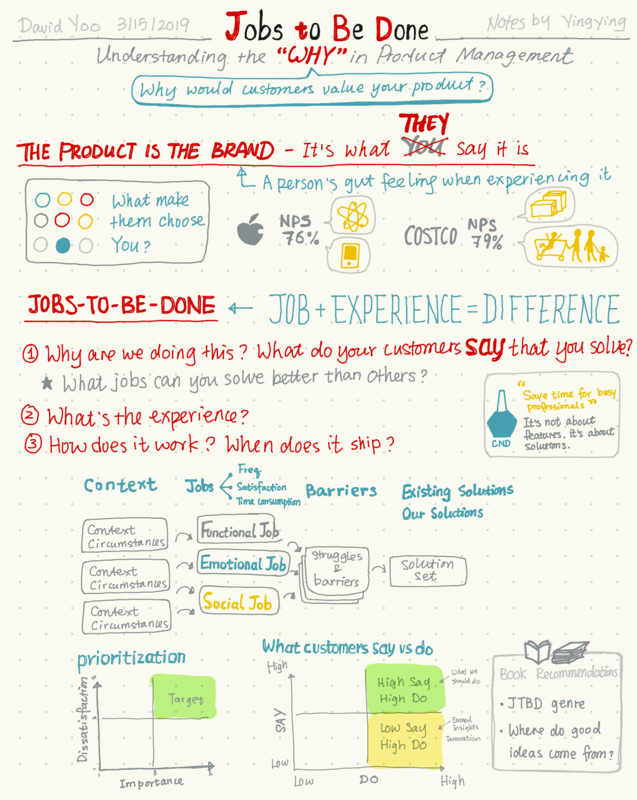 The “jobs” are what your customers do day-to-day. The core of the JTBD framework is to understand what jobs needs to be done and solve the most important/valuable ones for your customers. Functional: it’s a task, and they just need to get it done — get dishes washed; get from destination A to destination B. Emotional: whether they choose to do it or not do depends on their emotional preference — buy a more pricy bag because they have a good reputation. Social: they do it because it will influence their social presences in some ways or make them stand out from the crowd — get qualified for the Amex “Black Card” because means prestige; own a Tesla. It’s a really interesting way to think about what your product solves for your customers from these three perspectives, as we have long passed the era where we only need to help customers get things done. To truly understand what these jobs could be, we need to get close to our customers and users — observing and talking to them. Some good approaches are: Intuit’s “Follow-Me-Home” program, diary study from UX research. Listening to what customers say only is not enough. Usually, what people say ≠ what people do. Sometimes people simply can’t remember or be aware of certain actions, which could turn out to be key information to us. Once you have a collection of info from people’s talking points and behaviors, it’s time to prioritize them. High Say, High Do: The items mentioned and done most are what you should definitely solve. 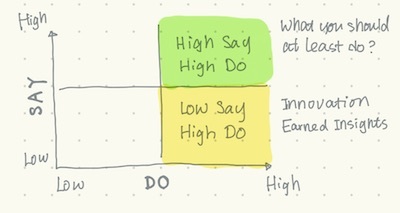 Low Say, High Do: These are “Earned Insights” and that’s where innovation is likely to happen. People tend to say it less because they may not realize it’s a problem, but their behaviors say it is. For B2C businesses, it goes without saying that your customers are your users — they pay for what they get from your products. Examples: Lyft, a user pays and enjoys the ride. For B2B & B2B2C businesses, it’s common that your customer (e.g. another company) buys for its dedicated set of users to use. In this case customers ≠ users. How close should you get to your customers and users? It depends on your business model. If you are selling IT security solutions to other companies. Your users are likely to be IT professionals. Even though the solutions are going to be deployed to everyone in those companies, they may not care about it. Therefore, those IT professionals should be who you reach out to. If your company is selling a product to other companies, they require their employees to use it, after those employees use it on their clients, and eventually you get paid because those clients use it. You need to reach out all of them.